When renewable energy heats the air in your attic or conservatory you can now use a new smart solar space heating system to harvest the free heat and reduce your heating costs and carbon footprint. The inexpensive system is 10 to 100 times more efficient than your current home heating system. This page gives details of the development from 2011 to 2015 of an innovative Solar Space Heating system that uses hot attic air. 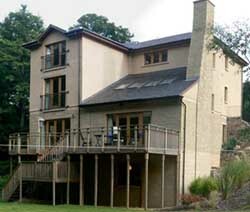 Most of the development of the Attic Heat Harvester System was done in a modern existing four storey home in Balerno, Edinburgh, Scotland, from 2011 to 2015. We find the AHH most beneficial during the Spring and Autumn (Winter is too cold and Summer is hot enough anyway). We find the AHH makes a great difference to our heating costs and on a sunny day it can heat the whole house if we keep the living area doors open and let the air circulate throughout the house. It is a great low maintenance, low cost, money saving secondary home heating system that we can easily adjust which we are delighted to have installed in our home! Delighted you put it in, (name supplied). The project aim was to determine if we could reduce heating costs by heating the home using free solar heated attic air. 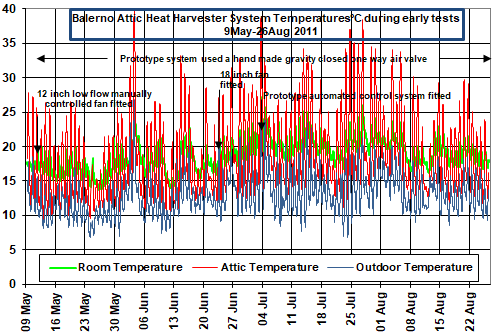 Attic, home and outdoor temperatures were recorded while different system components were fitted and tested. On 11th May a 305mm low flow manually controlled fan was fitted. On 2nd July a medium flow 450mm fan was fitted. On 29th July the first automatic control was fitted. The impact on room temperature can be clearly seen showing that harvesting free solar heated attic air was a viable and very efficient way to reduce heating costs by using ultra-efficient secondary home heating. Ducting the hot air down through three floors of the existing home was difficult as no straight vertical route was available, the only possible route had two right angle bends between the floor joists through tight restricted areas, these restrictions reduced the airflow rate finally achieved later to 1200cmh (720cfm). Initially a makeshift air valve was fashioned and fitted in the ducting to stop warm home air escaping from the home into a cooler attic. Late in 2011 a commercially available minimal energy electrically operated air valve was located which when fitted which considerably increased the airflow. 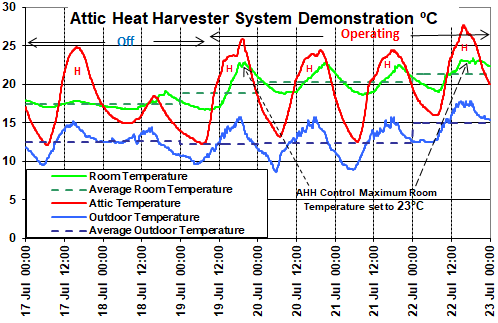 Data for the following charts was collected from the system in July 2012 after the custom Attic Heat Harvester Controller had been enhanced to calculate, display and record system performance parameters. 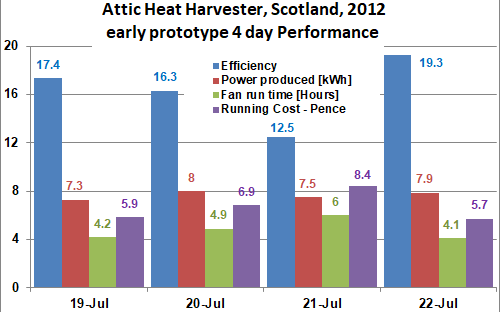 The next two charts show home temperatures and the Solar Space Heating system performance of the early prototype system over a six day period with the Attic Heat Harvester Off for two days and ON for four. The dark blue horizontal dashed line shows the average outdoor temperature over each 24 hour period. The dark green horizontal dashed line shows the average home temperature each day, this increased by 3°C from 19th to 21st July and by 4°C on 22nd July. The second chart shows the daily system Efficiency, the Heat transferred into the home, and the length of time the system was operating, and the cost. The total cost of providing 30.7kWh of home heating was £0.27, and the system efficiency was 17.3. 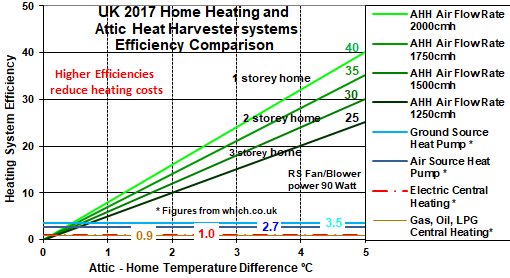 The following chart shows the 2017 efficiency of UK home heating systems compared with Attic Heat Harvester systems. Unlike other home heating systems whose efficiency remains constant the efficiency of solar space heating systems that use solar heated air is directly proportional to the both the efficiency of the airflow achieved and to the attic - home temperature difference. For heating systems high efficiencies result in lower costs. When Balerno attic and home temperatures permit the Attic Heat Harvester system has been providing secondary home heating since 2011 to reduce heating costs. From March 2012 until December 2017 the Balerno Attic Solar Space Heating system has transferred 5807kWh of renewable heat to the home at a total operating cost of £38.79, the annual maintenance cost has been £0. To provide the same amount of energy from the existing gas fuelled central heating system, using 2017 fuel costings, would cost £261. In 2015 a Conservatory Solar Space Heating system, based on the system developed for the above application, was fitted to a Mullion home's conservatory. Initially it's efficiency was twice that of the above system, but now that the initial fan used has been replaced by a new far far more efficient fan, the efficiency is almost 8 times higher and the operating cost some 8 times lower.